Yesterday would have been an excellent day to continue cleaning and waxing the outside of the bus—cool and cloudy without a lot of breeze—but it was also an excellent day for the inside computer work that we both needed/wanted to do. I downloaded the free version of the Simple:Press forum WordPress plug-in the day before yesterday and was going to make a priority of installing it today on the FMCA Freethinkers website I have been developing until the activation of the Jetpack Site Management feature caused the admin panel (app) to crash. We have had a problem for a while with one member who was unable (or unwilling) to interact appropriately online via our e-mail reflector. The reflector does not require a login and does not have any way to moderate discussions or block/remove posts, so our options as a chapter were very limited. A WordPress-based forum would give us all of those features. I had an e-mail reply from support@ipower.com indicating that the Wordfence plugin had caused the problem. They needed the answer to the security question in order to authenticate my support request and fix the problem. Bob Pelc provided me with that information which I supplied back to ipower.com. Later in the day I got an e-mail indicating that the problem was resolved and I was, in fact, able to log in without any problems. The e-mail said the Wordfence plugin had caused the crash and that they disabled it, but after I logged in it was still activated. I did not, however, take the time to check if it was functioning correctly. I also did not install the Simple:Press forum at this time. For breakfast Linda improvised a potato tofu scramble with nutritional yeast, garlic, and other seasonings. It was a hearty and flavorful start to the day. After breakfast I called Jim A. back to discuss the FMCA seminar listing categorization document we have been working on. I settled in to work at my computer on the consolidated blog post for November 10-16 while Linda settled in to work on accounting for the bakery. She is also approaching the time of year when she has to pull tax returns together. She uses Turbo Tax and needs an updated version each year. The products she needed were on sale through Amazon Prime. She purchased and download them, which also placed them in her Amazon software library, and they installed and opened without a hitch. I got an e-mail from Harvey Carter (AC8NO), president of the South Lyon Area Amateur Radio Club (SLAARC), asking me to update the officer listing on the club website. I took care of that and also changed that contact form (Contact Us page) to e-mail him instead of former president Mike Sharpe (WX8H). By 2:30 PM I was tired of sitting in front of my computer so I changed into my work clothes and spent an hour trying to clean and wax a couple of windows on the bus. The passenger side, which faces south, was so hot I cloud not touch it for very long, so I worked on the north side in the shade. Jim/Flo L. and Jim/Barb B. disassembled the Select Comfort air mattress we had put in the park model trailer and divided up the parts. We were going to donate it to the Salvation Army but did not get it done fast enough. Jim B. would like the pump and controllers but Butch and Fonda need them to replace the defective unit on the mattress in their guest bedroom. Since that is where I sleep when I am there, it is in my best interest to give it to them. We invited all of our neighbors to come over for happy hour at 4 PM. Barb B. came over with a glass of wine at 4:20 PM, so I poured a glass for Linda and me. Jim B. was taking a nap as were Butch and Fonda. (Hey; retirement is hard work!). Butch and Fonda eventually shook the cobwebs out and came over. Jim and Flo L. arrived but busied themselves with dinner preparations. They were joining Jim/Barb B. for a belated Christmas dinner. Jim B. eventually awoke and Barb left to join the other three for dinner. Fonda left just before 6 PM to go to church but returned a few minutes later. Apparently the evening service had been cancelled because of the Super Bowl. She and Butch visited as the sun set and eventually it got chilly enough that we all decided to go inside. I e-mailed Chuck Spera and my long-time friend John (J. C.) Armbruster earlier in the day but had not gotten responses from either of them by bedtime. During the evening I had e-mails going back and forth with Steve Willey regarding the upcoming informal FMCA Freethinker gathering at the Liar Peg Leg Smith Monument boondocking area in Borrego Springs, California. I also e-mailed Jim Ellmore regarding the same event. 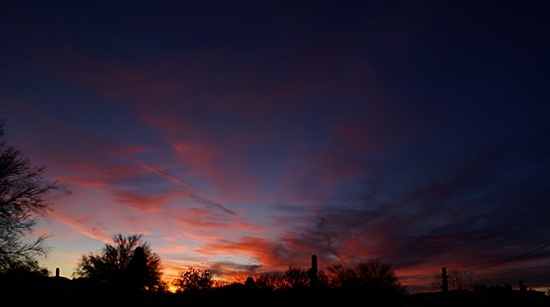 A typical sunset in Quartzsite, Arizona as seen from our campsite on the north end of town. The last 24 hours have brought into focus why we are here for the winter. It will be sunny and 80 degrees F today. Detroit got 16.7 inches of snow from the storm that hit over the weekend, with 12 inches in Ann Arbor and similar amounts in Dexter, Howell, and Brighton. When we checked this morning it was 7 degrees at home and going up to a high of 14. Yeah, we are not missing that. Breakfast was the bland store-bought bulk granola we have had to eat since running out of Linda’s homemade granola some weeks ago. I wish we could carry a five-month supply of her granola; it’s that good. Right after breakfast Linda started putting together menu ideas and a shopping list while I reviewed the latest seminar listing from Jim A. and e-mailed it back to him. He called later to discuss it briefly. I started working on yet another consolidated blog post for 17-23 Nov 2014 and did that until I could not stand to sit any longer. The antidote for was go outside and work on cleaning and waxing the rear cap of the bus. Butch and Fonda left around 9 AM and drove to Parker to go shopping at Wal-Mart. Back home they shop at the Wal-Mart in Logansport and are familiar with the items there. Not long after they left Linda drove to Blythe, California to do our grocery shopping for the week. Of the supermarkets available to us we prefer the Albertson’s in Blythe, followed by the Smart & Final Extra at the same intersection. Jim L. stopped by with some very fresh grapefruit and we got to talking about automotive detailing. He recommended Finesse from 3M for polishing paint without leaving marks. He said it works so well that the paint looks “wet” when you are done. Butch had also suggested that I look at the Cyclo 5 dual head orbiting buffer/polisher. Apparently this machine can finish paint with no swirl marks. The FMCA Freethinker website /WP-admin/ panel was back up and running. I logged in and checked the plugins. They were all there but they had ALL been deactivated. Tech support at ipower.com had indicated that they were going to disable the Wordfence plugin. I re-activated most of them, but not all, and specifically did not re-activate the Jetpack plugin. It is a large, feature rich plugin and the only thing I use is the Carousel feature to manage native WordPress image galleries. Unfortunately I need that feature and have not found another plugin that does what I need. I worked for most of the evening on the consolidated blog post. By the time I finished it was too late to start selecting and editing photos, so I will do that tomorrow if I have time. I knew there was something else I was supposed to do yesterday, but I could not remember what it was. I sometimes put “tasks” on my calendar, but that does not help if do not check it. I remembered this morning what it was; I needed to call Sunset Sportswear in South Lyon, Michigan and follow up on an e-mail I sent last Thursday regarding our order for personalized SLAARC jackets. I made that call and Pam took our credit card information. Barb handles sales but had not made it in yet due to the snow. Sunset Sportswear was closed yesterday because of the storm so if I had remembered to call them it would have been for naught. Things often work out like that. I also got an e-mail from the Escapees RV Club regarding the upcoming Escapade rally. It indicated we could extend our stay until Sunday noon. I called Lou Petkus, the head staff photographer for the Escapade, to let him know. The rally ends on Thursday with normal departure on Friday and staff departure on Saturday. Lou is trying to arrange a photography field trip for Saturday so the fact that anyone can stay until Sunday should help with participation. I called the SKP headquarters and booked the extra night. I confirmed which RV Park Lou and Val will be in on March 5th and I think we will try to get in there as well. That location will position us close to the rally venue and allow us to caravan in together and park together. (We have to be in by 11AM on the 6th.) That, in turn, should make our staff photography work more convenient. 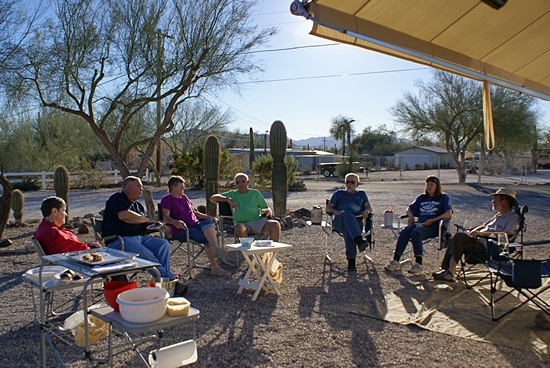 We plan to hang out (dry camp) with RVillage founder Curtis Coleman for a couple of nights before this at his rental home near Casa Grande, which will put us a lot closer to Tucson than we are here in Quartzsite. We had also mentioned to Lou and Val at Quartzfest that we were thinking of heading to Organ Pipe Cactus National Monument after the Escapade. They had been discussing it and decided they would like to go there as well so we will probably caravan there with them. After OPCNM we plan to head to Big Bend NP (BBNP) in Texas and Lou and Val would also like to go there. That is a three day drive for us, and we may take six or seven days to get there depending on where we might stop and what there is to see long the way. Whether we travel together or separate will be determined later. Our friend, Mara, and another women from the WINs are also headed to BBNP sometime in March and we have tentatively agreed to meet up with them if we can work out the timing. I checked my e-mail and had a reply from Jetpack tech support at WordPress.com. “Happiness Engineer” Jeremy said that Wordfence has been known to cause issues with the Jetpack plugin. He acknowledged that Wordfence is a powerful and important plugin but can be very aggressive in protecting websites. Given that Wordfence appears to have caused the crash of the FMCAA Freethinkers WordPress /WP-admin/ Jeremy said I probably did not need to reinstall the Jetpack plugin. I filled out a support ticket yesterday for this issue on the Wordfence website as I have a premium (paid) membership. They acknowledged the support ticket right away but an actual response will likely take longer. I had all of these communications chores done by 11 AM and decided to continue cleaning and waxing the outside of the bus. I started with the rear, as it was still in the shade, and finished the lower half. It was tedious as that is the engine hatch and it has numerous horizontal indentations that run the full width. These indentations are open on the inside top for airflow and have screens to keep things from getting in (like fingers). Another view of the sunset from our campsite in Quartzsite, AZ. I continued on around to the driver side of the bus which faces north. The temperature this afternoon got up to 80 degrees F, and it was very hot in the sun, but it was pleasantly cool in the shade of the bus. It was near perfect conditions for the work I was doing. I worked most of the afternoon and did not quite get the back half of the bus cleaned and waxed. A couple of bay doors and I will be past the half way point on that side. I am going to try to work on this at least a few hours every day, otherwise it will never get done and this is an ideal place to work on it as long as I am not working in the sun. The south facing passenger side is going to be more of a challenge and I will have to limit my work to the morning before the body panels heat up. UPS showed up today with my coil for the MAC valve which turned out to be an entire new valve. Rather than try to remove the solenoid coil I may just install the whole valve. UPS also brought Fonda’s new sewing machine. It only weighs 13 pounds. Butch got back from a rock hunting field trip late in the afternoon and we stood around chatting as an amazing sunset developed around us. As I have mentioned before, sunsets here are often 360 degree events and this one surrounded us with color before finally fading into another starry night. Linda made a wonderful dish for dinner last night and we had it again this evening. She pan-grilled polenta and served it on a bed of dark leafy greens topped with puttanesca sauce made from scratch. After dinner I selected photographs for my November 17 – 23, 2014 blog post and processed them. I uploaded the text to our WordPress site and then uploaded, captioned, and integrated each photo in turn. I also had to enter all of the tags, which I figure out as I read through the post. If there is one thing I would like to have at this point it is the ability to highlight key words and phrases in my Word document and have them automatically become tags when the text is uploaded. By the time I published the post and went to bed to finish this one it was midnight. At eight minutes after midnight MST I was one hour into my 63rd year as I was born on this date at 00:08 in the Central Time Zone, where eight minutes past midnight happened an hour ago. I finished my blog post for yesterday late last night and e-mailed it to myself at eight minutes after midnight, the hour and minute of my birth, or so I have always been told. Linda and the cats were all asleep and I observed the moment in quiet solitude. As I noted at the end of yesterday’s post I was actually an hour late in my observance as we are currently in the Mountain Time Zone and I was born in the Central Time Zone. But it was the thought that counted. Sixty-three is not a milestone birthday anniversary, other than making it that far. On my 60th birthday I became eligible to retire, and did so four months later. On my 62nd birthday I became eligible to start drawing social security, but didn’t. On my 65th birthday I will become eligible for Medicare. The year I turn 66 Linda will apply for Social Security benefits and immediately suspend them. I will be eligible for my full Social Security benefit but will not apply for it. I will apply for the spousal benefit instead. Our monthly Social Security benefits continue to increase by 8% per year until age 70, a solid and guaranteed return, so Linda will start taking her benefits then and I will file for, and take, my benefits when I turn 70. Having thought through the complexities of birthdays, we had breakfast and then I got to work cleaning and waxing the outside of the bus. My plan was to finish the driver side but not spend all day at it. As it turned out, I spent most of the day at it, taking breaks to check e-mail. It is just slow work, especially since so much of it has to be done on a step ladder. I have no idea how many trips I made up and down that ladder, but it was a lot. It is only a seven foot step ladder so I have to stand near the top to reach the top of the sides which are over 12 feet from the ground. I cannot reach very far to the side either, so I work from one side of the ladder then climb down and climb up the other side and work from there. I then climb down and move the ladder about three feet and do it all again; over, and over, and over. But as Long as I keep going it eventually gets done. I am, however, seriously considering getting a Cyclo 5 dual head orbiting buffer/polisher. There is simply too much bus to do this by hand. I am also considering getting a platform to put between two ladders and/or a four-wheel elevated work platform to use in the barn if/when we get it built. I got a call from our daughter wishing me a happy birthday and had a nice chat with her. I asked if Katie had made a final college selection but she is not done with interviews yet. Perhaps we will know in a few weeks where she is headed in the fall. Yesterday Linda invited all of our camping neighbors to come over today at 4 PM for happy hour to celebrate my birthday. In preparation she spent part of the day making cupcakes with chocolate frosting. When she wasn’t cooking she did accounting and tax return work for Butch and Fonda. Around 3 PM she prepared bruschetta using what was left of a loaf of Barry’s Basic Bread and the puttanesca sauce she made a couple of nights ago. Larry/Sandy, Jim/Barb, and Butch/Fonda all brought chairs and beverages of their choice. Butch and Fonda brought chips, salsa, and hummus and the peanut and dried fruit mix they make. We sat around talking until the sun set at which point the air temperature cooled off and we all retreated to our rigs. I got a call from our son during our happy hour and excused myself for a few minutes to chat with him. It was 7:40 PM back in Ann Arbor and Madeline was getting ready for bed. I got to “chat” with her and she wished me a happy birthday. With encouragement from her mom she asked me “How is Arizona?” I told her it was very nice here. We skipped lunch today and did not have dinner because we filled up on happy hour snacks. Linda played online word games while I started assembling the consolidated blog post for November 24 – 30. She turned on the MiFi and trundled off to bed to watch an episode of Downton Abby on her iPad. I finished editing the post and selected two photos to go with it. When I checked I found that I did not have photos for most of the days covered by the post. I thought about uploading it but decided against it as it still takes time to upload the text, upload and insert the pictures, and create all of the tags and I was too tired to maintain the needed concentration. Somewhere in there I read through a reply from Chuck Spera and sent him the next volley in our e-mail conversation. Overall it was a good 63rd birthday. Given our winter travel lifestyle I face the interesting prospect of celebrating my birthday somewhere different every year for many years to come. Our fellow campers gathered by our bus for my 63rd birthday happy hour. L-2-R: Sandy, Larry, Barb, Jim, Butch, Fonda, me. Photo by Linda (not shown). The overnight lows are now dropping into the upper 40’s at night and the coach cools off just enough that I turn the heat on in the front of the bus while I make coffee in the morning. Soon enough the sun starts heating up the coach and we are pulling the accordion shades down to keep it out and opening windows and turning on ceiling exhaust fans to draw cool air in. A couple of days ago we finally put the awnings out on the south facing passenger side of the coach. Between the patio awning and the bedroom awning they shade more than half of the upper portion of the coach and help keep the interior temperatures in check. We have not had them out much, however, because of the somewhat persistent winds in the La Paz Valley. After breakfast I wanted to setup the TireTraker TT-400C TPMS. Once I started I would need to install the sensors on all 13 tires. In order to install the sensor on the spare tire in the car I had to empty out the back so I could get to the tire. Linda was helping me and noticed a screw in the passenger side rear tire. It was right at the edge of the tread but not technically in the side wall. The tire was holding pressure but when I started to back the screw out it started to hiss so I screwed it back in. Nuts. Linda got online to look for tire repair shops in Quartzsite. The first three numbers we tried were out of service and the Love’s Truck Stop only repaired big tires, not small ones, so I called Jim Liebherr to see if he knew of some place in town. Flo answered the phone and could not locate Jim so I asked for a return phone call. Butch then offered to drive me downtown where he thought he remembered seeing a tire shop. As we were pulling out of our camp it occurred to Butch that the RV Pit Stop, just south of us on Central Avenue, might do tire repairs. Before we even got that far we saw the sign for Best Auto and Tires. We have walked or driven past this place dozens of times but never paid any attention to the fact they sold and serviced tires. At the time we did not care. They said they would have to see the tire so we drove back to camp and I drove back in the car. They said they could repair it properly with an internal patch and they would get right on it if I wanted to wait for it. $14. Deal. I could easily have walked back to camp from there but I was back with the car within an hour. If the tire had not been repairable we would have had to take it off the car and use Butch’s Chevy Suburban to drive it to Yuma or Lake Havasu City where there are Discount Tire Locations. Jim L. returned my earlier phone call while I was waiting for the tire. He and Flo use a dentist in Los Algodones, Mexico and are very satisfied with the service and price. I have a tooth that is bothering me just a bit and was giving some serious consideration to making an appointment with someone in Los Algodones. I installed the batteries in our new TT-400C sensors and programmed the baseline pressures into the monitor (receiver). I then installed the sensors on the bus and car tires, linking each one to the monitor as I went. Programming the baseline pressures first is the easier way to install the system. In setup mode the monitor displays each tire position in turn. While the position is displayed a sensor is screwed onto the valve stem. The application of pressure to the sensor “wakes it up.” When the sensor starts transmitting the monitor associates it with the displayed tire position. After exiting setup mode only the programmed tire positions display on the monitor. In addition to the overall setup procedure there are several things I like better about the TT-400C system compared to the PressurePro system we have had since the 2008 FMCA national rally in St. Paul, Minnesota. A major one is that the baseline pressures are programmed into the monitor. On the PP-TPMS the baseline pressures are determined by the pressure in the tire at the time the sensor is put on. Another thing I like is that the TT-TPMS monitor is powered by rechargeable batteries and is not plugged in when in use. That makes it much more convenient to move it between the bus and the car, but especially to carry it around while installing and associating the sensors to wheel positions. Finally, I like the sensors, which are much smaller and only weigh 0.4 ounces each. Linda helped me reload the back of the Element and sort through all of the “stuff” that was “stuffed” in the glove box and the passenger side dashboard trays. (When was the last time someone actually stored gloves in an automotive glove box?). With everything sorted out and repackaged in ZipLock bags I stored it back in the glove box and locked up the car. Linda spent part the morning working on accounting and tax returns for Butch and Fonda and talking on the phone to Dave, the controller at Metropolitan Baking. I got a call later from Jim Ammenheiser and then did a final proofreading of our Education Committee recommendation to FMCA staff for how to restructure the categorization and listing of seminars and activities in the national rally programs. We took a break and had the last two cupcakes from yesterday with some vegan Mocha Almond Fudge coconut “ice cream.” We were supposed to have these last night for my birthday but we were not hungry after snacking at the happy hour birthday gathering. Linda then went for a walk. Linda got me a birthday card and a towel with an elastic edged hole for my head. I tend to get food on my shirts when I eat and the towel is basically an adult bib that can be easily laundered. Our fresh water tank was a bottle cap shy of empty so I filled it. It usually takes about 50 minutes to fill the tank starting from empty so I set the timer on my smartphone for 40 minutes. When it signaled me to check on the progress the tank was already overflowing. (It has a vent tube on top of the tank that runs through the floor of the bay.) I don’t think I wasted more than a few gallons of soft water so it should not throw my water usage and softening calculations off by much. The good news was that the post-fill hardness test showed the water coming out of the softener at 0.0 to 0.5 gpg total hardness (0 to 10 ppm.) That was better than the reading I got right after I recharged the softener, so perhaps it still had some residual salt in it initially. At 4 PM I was getting ready to upload a blog post when the UPS truck showed up and dropped off two boxes for me. It was the Chemical Guys microfiber products I had ordered recently, including two microfiber auto detailing aprons. Butch returned a few minutes later with a small package for me. It was the lens hood I had ordered for my Sony zoom lens and it had been mailed USPS. He also had eight (8) Full River 6V L16 AGM batteries. I helped him unload them from the Suburban onto the concrete pad on the driver side of their bus. Fonda emptied out the driver’s side of their battery bay and she and I then moved the batteries to the bay where Butch positioned them. He left them in their boxes and will install them when they get back to Twelve Mile. At 5:15 PM I finally got around to uploading the consolidated blog post for the last week of November (2014). I then started thinking about what to do with my December 2014 posts. As of today I am still 67 posts behind and putting up daily posts is not realistic. In looking through my photos I was surprised to find that I took very few from the time we left the house until we arrived in Quartzsite. I decided to do consolidated posts for Dec 1 – 4 (Twelve Mike, IN to Alvarado, TX), 5 – 8 (visit with Donn Barnes), and 9 – 12 (travel from Alvarado to Quartzsite, AZ). I have more pictures for the rest of the month, so I will have to figure out what makes sense. I compiled the posts for December 1 – 4, selected and processed one photo, uploaded it, selected the categories, and entered all of the tags. I posted it and then realized I wanted to edit the URLs slightly so I logged back in and found that I was unable to type anything. It took me a while to figure out that the problem was the built-in keyboard on my ASUS G750JM ROG notebook computer. I got it at the end of April last year, so I have only had it for eight months. I decided to run a full scan using ESET Smart Security since I could do that with just a mouse and the Bluetooth mouse was working just fine. It found 18 threats and dealt with 16 of them. I then ran CCleaner, after which I enabled the onscreen keyboard. Although intended for use on touchscreen computers, at least I could type things into a search box using my mouse. I found some references to similar problems on answers.microsoft.com with the suggestion to examine the keyboard device properties. If it indicated the device was installed and working correctly it was probably not a Windows 8.1 problem. The other suggestion was to try an external keyboard. If that worked it would confirm a keyboard hardware problem. I had already gotten my Gigaware wireless keyboard out so I plugged in the USB dongle, turned on the keyboard, and voilà, I could type again! Another post on the Windows forum listed website links for ASUS support so I started following those. One ASUS website wanted the serial number of my computer, which I had to get off of a tag on the bottom of the case with really small type. Once I had that entered correctly I was able to go to a download page with 81 files available, including bios and chipset code. There were two files that seemed to have something to do with the keyboard. By 1:15 AM I had a half dozen tabs open in two different browsers with no definitive understanding of what had happened or what to do to fix it. I then realized that the Shift Lock key on the keyboard was illuminated and I could toggle it on and off. I could also toggle the Number Lock, so I tried typing and the keyboard was working once again. That, however, did not give me any confidence that it would continue to do so. I decided I was not going to shut the computer down for fear of not being able to log back in on startup. I was not about to start downloading and installing anything at that hour so I went to bed tired, annoyed, and, frankly, a bit discouraged by this unwelcomed turn of events. This entry was posted in Arizona, Computers, Escapade, Family-Friends-Home, FMCA, FTH, Natl Educ Committee, Photography, RV-Travel, SKP, WFPB, WordPress and tagged 55th SKP Escapade (2015), 63rd birthday (BRF), adult "bib", Albertson's (Blythe CA), Amazon Prime, ASUS G750JM keyboard problem, Best Auto & Tires (Q), Brendan, bruschetta (WFPB), bus washing (H3-40), bus waxing (H3-40), Butch & Fonda Williams, Chuck Spera, Cyclo 5 dual orbital buffer, desert sunset, Escapees RV Club (SKPs), FMCA FTH Ch, FMCA national education committee, fresh water tank, FTH-WP, Full River L16 6V AGM batteries, grilled polenta & greens w/ puttanesc sauce (WFPB), Harvey Carter (AC8NO), iPower webhosting, J. C. Armbruster, Jim & Barb Brockner, Jim & Flo Liebherr, Jim Ammenheiser (FMCA NEC), Jim Ellmore (FTH), Katie Bortz, La Paz Valley (AZ), Larry & Sandy (Q), Lou & Val Petkus, M Finesse auto polish, MAC solenoid air valves, Madeline (MEF3), Mara Culp, Meghan (MEF2), microfiber cloths (Chemical Guys), Organ Pipe Cactus Natl Monument, PressurePro TPMS, Select Comfort air bed, Simple:Press forum WP plugin, SLAARC club jackets, SLAARC-WP, Steve & Liz Willey (FTH), Sunset Sportswear (S. Lyon MI), tire repair (Honda Element), TireTraker TPMS (Daryl Lawrence), Turbo Tax, vegan chocolate cupcakes, wireless keyboard (Gigaware), Wordfence Security WP plug-in, WP happiness engineer, WP Jetpack Site Administration on 2015/02/05 by BRF.